How Will a Trampoline Impact Homeowners Insurance? If you have never been on a trampoline, you may not understand the appeal. As a parent, however, it is almost a given that your child, or children, will ask you for this exciting piece of equipment. It is hard to say no, especially if you have been on them, because they are very entertaining and help to get the kids outside. Unfortunately, they also come with their own risks, and some insurance companies are very specific about what they will allow. There are many insurance companies available in the marketplace, and they all decide on their own if they will allow their insureds to have trampolines or not. Now, you may think that it is your home and you can do what you want. 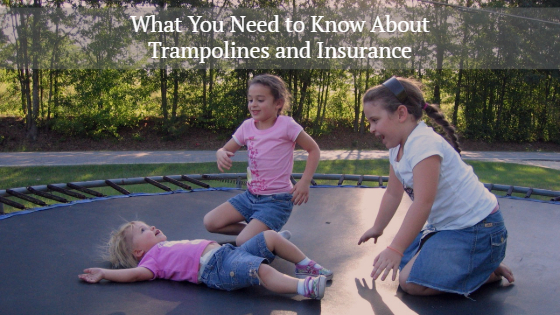 While that is true, if your insurance company specifically excludes trampolines from your policy and someone gets hurt, you would not be covered for any lawsuit or medical bills that pop up. There are definitely insurance companies that are okay with it, with some rules attached. Be sure to do your research, or, better yet, work with a licensed insurance agent so they can find you a company that accepts this must have equipment for your children. Have a net - Nowadays most new trampolines come with a net that is attached to it to help keep kids (and adults) from falling off. It also comes with foam to put around the metal bars and padded nylon to cover the coils to reduce injury and avoid pinches. Locked fence - Especially if you live in a neighborhood full of curious kids, it is a good idea to have a fence that has a locked gate. This will keep kids, or anyone for that matter, from coming in your yard and getting on the trampoline when you are not home to supervise. Limit persons - Be sure to set a limit of how many people will be on it at one time. Remember, the more people on the trampoline, the higher the risk for injury. Communicate rules - Tell anyone, including your kids, what the rules are for the trampoline. Make sure that everyone clearly understands what they are, such as how many people, how long of a time limit, and to report immediately if someone gets hurt. Waivers - This may seem like an extreme step, but it is one we must put on the list. If you are going to be responsible for anyone else’s children, have them sign a waiver to hold you harmless should something unfortunate occur. Trampolines can be an amusing thing for kids and adults to do. They are great for keeping kids active and outdoors, and are fantastic to help with your fitness goals. Keep in mind that when it comes to insurance, the goal is to avoid claims, and if you follow the above risk management tips, your risk for a lawsuit will be reduced greatly. If you have questions about how buying a trampoline will impact your insurance, contact Rumbaugh Insurance in Hanover Pa.